Each summer, Georgina Moon and her husband sail and live aboard their boat Fandancer in Greece. 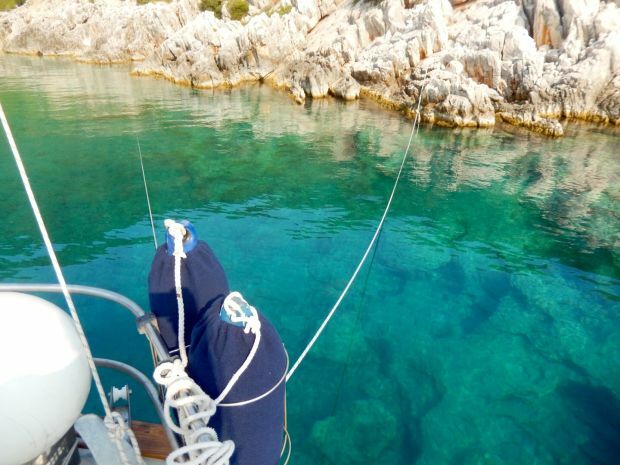 In addition to creating some great guides that show you where to go and what to see while sailing in Greece, Georgina is also happy to give some tips for sailing and living on a boat. 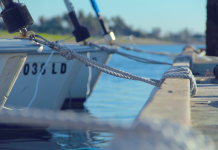 This week, you can learn more about anchoring with lines ashore. Follow this 7-step list to help make anchoring your yacht in small or busy bays easy and stress-free. In the height of summer, popular anchorages fill up quickly and you may find it difficult to find somewhere which will give your yacht enough swinging room once you dropped your anchor. 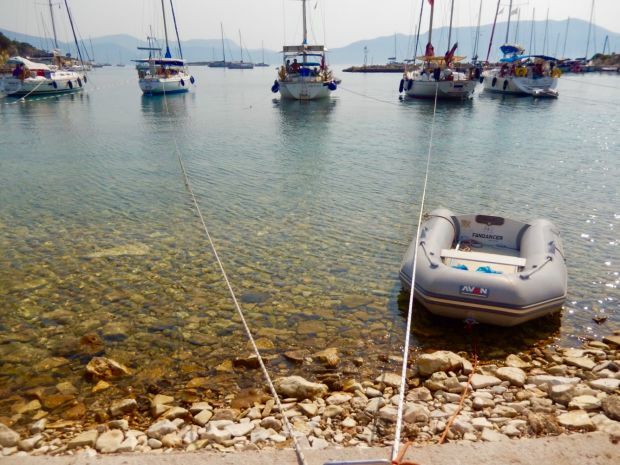 In smaller bays, such as those around the north of Meganissi in Greece, and also harbours that get very busy such as Kioni on Ithaca or Lakka on Paxos, it is becoming more and more common to anchor and take stern lines ashore. Your lines will be secured to something on land, such as a tree, rock or if you are lucky, a mooring ring or post. In this way, many yachts can anchor close together and share a small bay. Anchoring is not always easy. You have to get the lines ashore somehow, usually by dinghy or by swimming. If the wind is blowing offshore, or across your bow, the manoeuvre will be tricky and you may find yourself drifting into other boats until you are secure. Here are a few tips to ensure that anchoring in this way goes smoothly. 1) Prepare everything before you approach the anchorage. If there are going to be other yachts nearby, put out fenders. 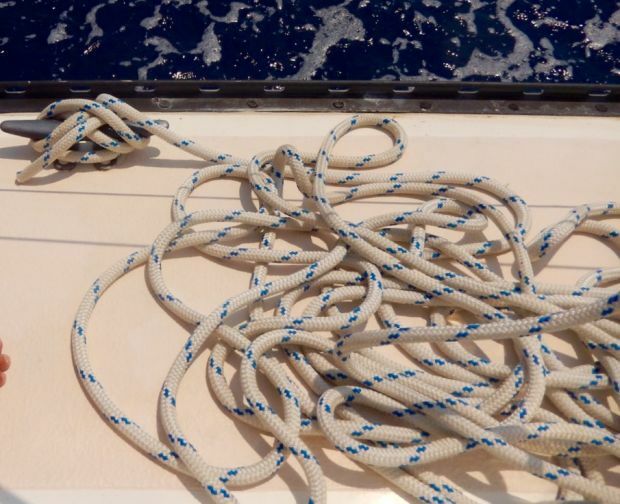 Take your longest lines from the locker and get them ready – this involves ‘flaking’ the rope, which means laying it on deck loosely – not coiling it – so that it does not tangle when it leaves the boat. 2) If you already know that there is something onto which you can tie the line, like a post or a rock, you might put a very large bowline, in the end, so the line can easily go over it. 3) Drop your anchor approximately three boat lengths away from the position where you want to end up, depending on how deep it is. Make sure you know the depth of your keel and check how much water is under your keel while you are going astern. Do not rely on just looking at the water, it is often deeper than it appears, but also, keep an eye out for rocks or obstructions. Hold the boat in position with the anchor, keeping the engine going astern, and decide how you will get the line ashore. 4) If you send a swimmer with the rope, it is a good idea for them to wear rubber soled shoes in case they need to scramble ashore or climb up rocks. 5) If you send someone with a dingy DO NOT throw them a coiled up rope. They will not be able to row or motor away from the yacht and untangle it at the same time! You must only give them the very end of the rope, the rest stays on the boat and should be paid out freely as you have already flaked it on deck. 6) Choose something on shore to tie to, that is angled approximately 45 degrees from the stern quarter. Once the first line is secure on land, pull it in from the boat until it is tight. It might be useful to secure it to a winch and wind it in. You may wish to pull in the anchor slightly until the boat is in position. You can take your time with the second line from the stern of the boat and secure in the same way, although another line is not always necessary. 7) When leaving your anchorage, check the wind direction and release the line furthest from the wind, first. Once you get used to anchoring like this, it will give you more confidence to visit small bays and busy harbours on your chartered yacht. 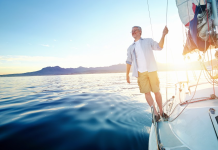 Anchoring your boat can be just as easy and worry-free as chartering a boat for your next holiday with Zizoo. Learn more about yacht charter holidays in Greece with our guide and find the best deals here.